The number of DoD personnel deployed to help their fellow citizens in Puerto Rico jumped from around 4,600 to around 6,400 members, Gov. Ricardo Rossello said during a San Juan news conference today. The governor briefed on all the lines of effort as the island commonwealth strives to recover from the devastating effects of Hurricane Maria. Supply ships continue to arrive and the governor and federal officials are working together to ensure food, water and fuel get to the people who need it the most. The number of DoD personnel will rise and fall as missions begin and end, Rossello said. DoD personnel are working in support of the Puerto Rican government and the Federal Emergency Management Agency -- the lead federal agency for disaster relief efforts on the island. After food and water, distribution of gasoline and diesel is the most critical need, the governor said. “We’ve been increasing the number of gas stations that are open,” he said. There are more than 720 gas stations open across the island. The island will receive more fuel in the coming days with close to a million barrels of diesel and half-a-million barrels of gasoline arriving on the island. This is important as diesel is needed to run generators providing electrical power for key infrastructure -- such as hospitals -- in areas where Maria knocked out the power grid. The distribution of food and water is a testament to the cooperation between commonwealth and federal capabilities, Rossello said. “It is critical that we can establish what the needs are, what the expectations are and that we can guarantee that the food and water are being delivered to the people of Puerto Rico,” he said. Yesterday, 213 containers arrived on the island that will be distributed to the regional staging centers by DoD and FEMA personnel, the governor said. There are still communities where the roads are blocked by landslides or where roads were washed out, he said. 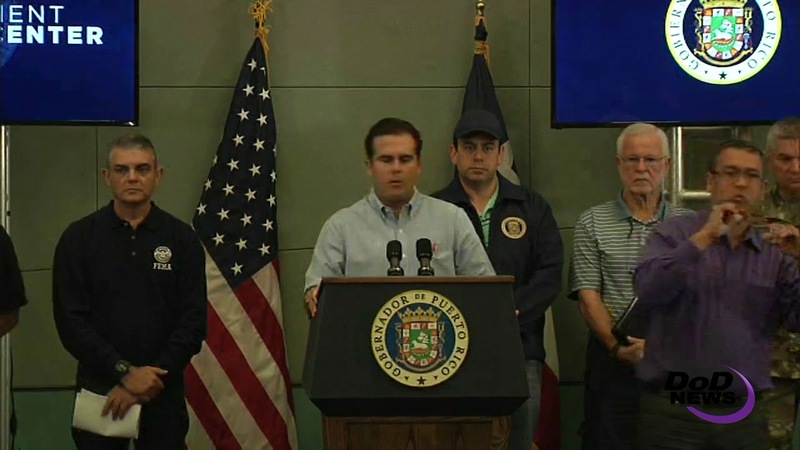 “One of the main efforts that the DoD will take on is making sure that we can air supply food and water to those communities while we establish direct connection through the roads,” Rossello said. Telecommunications is another critical line of effort and they have restored service to 36 percent of subscribers to date, the governor said. The areas where Maria came ashore -- the southeastern part of the island -- remain without cell service as the commonwealth must get into the area to repair antennas and other telecom infrastructure. Land lines have been totally restored, he said. There are about 8,800 refugees in shelters now and the government will consolidate them into 139 shelters, Rossello said. “We are making sure people get to their homes when they can get to their homes, and providing alternative housing in the meantime,” the governor said. Capacity in the seaports and airports is increasing, Rossello said. The former Roosevelt Roads Naval Station is the headquarters for the recovery effort and the Air Force is running airfield operations there. DoD personnel are augmenting local medical personnel in some areas of the commonwealth and assets are arriving to deliver medical care to those whose medical facilities are too damaged or blocked, the governor said. The Navy’s hospital ship USNS Comfort is expected to arrive at the island October 3 or 4 and will bring its 1,000-bed capability. DoD personnel will establish a logistics effort for two areas on the island where more hospital support is needed, the governor said. “The DoD will establish some alternative locations, those being in the southeastern part of the island and in the middle north of the island, so we can get patients to the hospital and the service that they need,” Rossello said. “This is another example where the federal government -- FEMA, Health and Human Services, DoD, local government and municipalities -- need to have a critical loop and conversation so we are updated continuously on what’s going on,” the governor said. The Army Corps of Engineers is working with Puerto Rican officials to rebuild energy production facilities on the island, Rossello said. The governor praised the assistance coming to the island provided by National Guard personnel coming from stateside locations. New York has sent UH-60 Black Hawk helicopters and their crews. 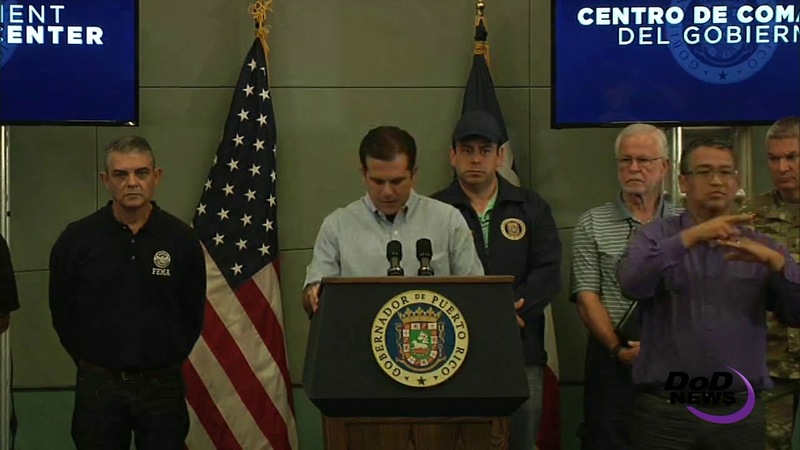 New Jersey is sending soldiers and airmen to assist, as are 12 other states, Rossello said.